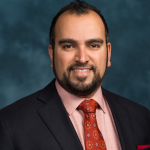 Dr. Ghaferi joined the University of Michigan faculty in 2012 as an Assistant Professor of Surgery in the School of Medicine and an Assistant Professor of Management and Organizations in the Stephen M. Ross School of Business. At the Ann Arbor Veterans Administration Healthcare System, he is the Chief of General Surgery and Founder/Director of the Bariatric Surgery Program which serves Michigan, Ohio, and Indiana. He is also the Director of the Michigan Bariatric Surgery Collaborative, a statewide quality collaborative seeking to advance and improve the science of bariatric surgery. Dr. Ghaferi’s clinical practice is devoted to advanced laparoscopy, including gastroesophageal reflux surgery, bariatric surgery, and abdominal wall and groin hernias. Dr. Ghaferi’s research focuses on understanding the relationship of organizational culture to quality and efficiency, with the ultimate goal of designing interventions to improve care locally, regionally, and nationally. He is currently funded by the NIH, AHRQ, and PCORI to assess the micro-system resources, the safety attitudes and culture, and the safety-related practices and behaviors that are potentially related to “failure to rescue” –the ability to recognize and manage major postoperative complications.